I am the kind of baking nutter who watches the bake off like it's a competitive sport. I have literally been known to shout at the screen when I think someone's making a huge mistake. I actually thought about applying for this season. I have thought of every possible flavour combination for a swiss roll: lemon poppy seed, chocolate with a macerated berry cream, green tea & lavender, grapefruit with homemade grapefruit curd & maple bourbon & pecan roll. I actually made the last two, swiss rolls are surprisingly easy to make & are really quick to cook (about 8-10 minutes in the oven). But my favourite (& the one my family finished quickest) was the maple bourbon one so I thought I'd share the recipe. Preheat the oven to 200C/400F/Gas 6. Line a 30 x 20cm Swiss roll tin with parchment paper. For the swiss roll: whisk the eggs, sugar & maple syrup extract until pale & the consistency of lightly whipped double cream (takes about 10-15 minutes with an electric whisk). Gentle-y fold the flour into the egg mixture being careful not to knock out too much air. Pour the mixture into the prepared tin & shake until even & bake for 8-10 minutes or until the sponge is firm to the touch. Turn the cake out onto a clean tea towel dusted with icing sugar & roll it tightly. Allow the cake to cool rolled in the tea towel. Whilst the cake is cooling start the candied nuts that make up part of the filling. Stir together the maple syrup, pecans & spices & then place on a lined baking sheet in a 325F/gas Mark 4 oven turning the nuts every 5 minutes or so until the nuts are sticky & the coating appears dry. Once the nuts are cooled, roughly chop a small handful & stir into the marscapone. Flavour this mixture with maple & bourbon to taste, tightening up with icing sugar/cornflour if necessary. oooh this looks really lovely! I've never had much luck with swiss rolls but after watching the bake off I'm tempted to try them again. I get really in to GBBO too and I wish I had the skills to come up with flavour combinations and bake intuitively but I'm just not that good, haha. I love your flavour combinations; green tea and lavender sounds amazing! Coming up with flavour combinations is just a matter of practice, I totally recommend the flavour thesaurus as a beginners guide :) It becomes instinctive super fast. Mmm looks lush! I'm not a good baker but GBBO has made we want to get cooking too so I was baking away today. Can't eat any of it though because I'm on Slimming World! Never mind! This sounds all kinds of awesome! 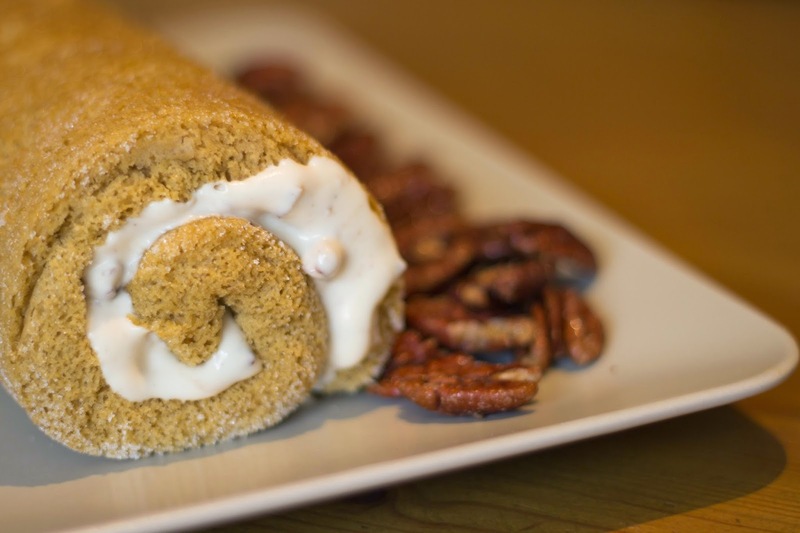 I've never made swiss roll, might have to give it a go!